The best money decision that inventor Shaun Pulfrey ever made was registering the intellectual property rights for his Tangle Teezer haircare products. It is a decision that has made him more than £12 million. Eleven years ago, the former hairdresser failed to get any financial backing from the entrepreneurs on hit BBC TV show Dragons’ Den despite spending £98,000 of his own money patenting the design of the innovative detangling brushes. But he then went on to make a huge success of his business. He is now a multi-millionaire whose products can be bought in more than 90 countries worldwide. Some 40 million of his hair brushes have been sold. Now 56, he owns outright his £2.6 million home – a townhouse in Clapham, South West London – and spends £350 a month on Creed cologne. Despite success, he has never forgotten the frugal habits he was forced to adopt when a struggling self-employed hairdresser. He still turns off lights when he leaves a room and saves any safety pins, elastic bands and bits of string that he finds ‘in case they turn out to be useful’. Tangle Teezer hairbrushes are sold in all Boots stores, including his newest innovation, The Wet Detangler. Launched in May this year, it is the first Tangle Teezer with a handle. My father was a self-made man so my childhood was centred on the value of money and how much things cost. He was the working-class son of a barber and the eldest of eight kids. From being a deckhand on a boat, he became a deep sea fisherman who started his own company. He would go away for two weeks at a time every month. My mother was a stay-at-home mum. By the time she was 21, she had me, my brother and sister to look after. Money was not tight but it was hard-earned. Dad’s business was successful and I grew up comfortably off. We had a nice car and went on foreign holidays. I was the second child in my school to get a colour TV. But my parents were careful with money. Even to this day, my mother says she will not spend what she has not got. What was the first job you ever did? Washing glasses at The Flamingo nightclub in Cleethorpes, North Yorkshire. From midnight until 3am, at the age of 15. They paid me £12 an hour because it was hard work at a fast pace. I really felt like I had earned the money at the end of the night. Have you ever struggled to make ends meet? 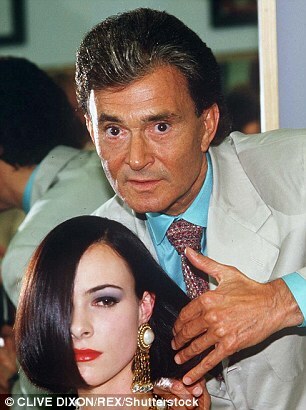 When I first came to London as an apprentice for Vidal Sassoon, I earned £36 a week. After paying out for Tube fares and room rent I barely had anything left. I lived in Leytonstone with this guy who had been living beyond his means and needed a lodger. He only had one bedroom so he put up a curtain to divide the room. I slept on one side and he slept on the other. It was the only accommodation I could afford. Did you work with Vidal Sassoon? Yesand I even coloured his hair a few times. He was a good man. He liked it dyed light brown – the technical code for that colour is 5.0. Have you ever been paid silly money? What was the best year of your financial life? It was 2010 because that was when I became comfortable enough to buy my mum whatever she wanted – a caravan and a new car. I also rebuilt her bungalow room by room. I did not buy anything for myself that year. I was happy with what I had. What is the most expensive thing you bought for fun? It was a drone that cost £2,500. I bought it six years ago and have only flown it once – in the garden. It came down and decapitated the plants. Maybe I need practice and a bigger place to fly it. What is your biggest money mistake? I invested £10,000 in a friend’s company before I launched Tangle Teezer in 2002. It was an interactive exercise bike that hooked up to the internet and challenged people to go faster. It was not a commercial success and I lost every penny. The best money decision you have made? Registering all the intellectual property rights for Tangle Teezer. It cost £98,000 and was the best investment decision I have ever made. Given I invented the products when a sole trader, I own a lot of the patents and designs myself and just license them to my business. That means I get a percentage of the turnover of the business which is now a multi-million pound company. I have made more than £12 million from my intellectual property rights alone. I did all the research and development for Tangle Teezer in my spare time while I was working full-time in a salon. I created this unique technique for detangling hair which made the teeth of the comb and the brush bend and flex. I then created a brush that mimicked that technique. It was an innovative product. Do you save into a pension or invest in the stock market? I used to be self-employed in the salon so I only started saving into a pension in 2009 when the money started coming in from Tangle Teezer. I save the maximum amount I can every year because it is tax-efficient to do so. My savings are invested in the stock market, but it is all managed by a financial adviser. I take a low risk approach. As long as I can beat inflation, that is fine. Yes, I have four properties. For many years I lived in a two-bedroom flat in Brixton, South-West London, I had bought for £74,000. But my home now is a nice house in nearby Clapham. I paid just under £1 million for it in 2013 and invested another £700,000 in improving it. The property now has a real wow factor. I think it is worth around £2.6 million and mortgage free. The other three properties I rent out to family and a friend at low cost. I am a generous landlord. Do you pay off your credit cards in full? Yes, always. I do not live beyond my means and have never had an overdraft. I always turn off lights when I leave a room and keep safety pins, elastic bands and bits of string I find in case they turn out to be useful. I have got an American Express Centurion card, known as the ‘black card’. It is an invitation-only card, one of my personal ‘you have done well’ status symbols to myself. What is the one little luxury you treat yourself to? If you were Chancellor what is the first thing you would do? I would reduce inheritance tax from 40 per cent to 10 per cent on sums over the nil-rate band of £325,000. I have earned my money and I would like to be able to give it away as I see fit. Do you donate money to charity? I am a patron of the Prince’s Trust. I help out with the trust’s enterprise programme which assists 18 to 30-year-olds in turning their ideas into businesses and becoming entrepreneurs. What is your number one financial priority? To carry on making my business a great success and ensuring all my family will be financially secure for life.